Do you have a personal Food Storage Trainer? I do. Her name is Crystal and she is amazing. Recently I have started frequenting a Mormon Cannery. (A what? Look is up yourself. You may have one in your area, and they are worth checking out.) Through searching the internet looking for a cannery location, I came upon Crystal's blog. She is young, busy with little children, and yet has time to put together a terrific blog. Videos and recipes, and all sorts of information to pour over. Over the past few months, I have tried many of her recipes. 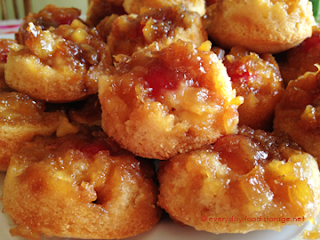 In fact yesterday, I wowed the family with a Pineapple Upside Down Cake made with ... wait for it ... garbanzo beans ! Okay okay, Crystal told me to use white beans, but I didn't have any. With a can of garbanzo beans on the shelf, I did what I had to do. Yummy. I was going to take a picture, but it's all gone. Below is Crystal's picture. I hope that she doesn't mind me borrowing it. She put hers in muffin tins for individual little cakes. I was lazier than her, and popped mine in a 9x13 pan. All was well. Below is her recipe. I tweeked it a bit only to make it easier to read. 1. Combine brown sugar and 1/2 cup butter; spread on bottom of greased 9×13 inch pan. Place pineapple rings and cherries on top. 2. Cream the remaining 1 cup butter (or bean puree) with sugar. Add vanilla and eggs and beat well. 3. In a separate bowl, stir together flour, baking soda, and salt. Add to creamed mixture. 4. Beat in 1 cup of the reserved pineapple juice. Pour batter over pineapple rings and bake at 350 degrees for about 45 minutes, until toothpick inserted in center comes out clean. 5. Cool slightly, serve warm. To serve, flip individual cake pieces over to show pineapple. Top with whipped cream if desired. Try this recipe and check out her blog. Enjoy!